Hannu Hautala's (b. 1941, Töysä) early interest in nature soon turned into observing the nature through a camera. A hobby changed into a career, as a mechanic became a photographer in 1970. 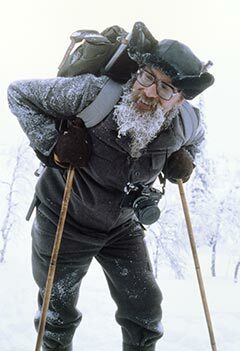 Hannu Hautala has mainly carried out his life-work as a nature photographer in Kuusamo, where he moved in 1979. The main goal of Hautala's work has been to portray his photographs in the form of books. Over 50 books have already been published, and in addition to Finnish, books in English, German, Swedish, French, Japanese, Italian, Russian and Spanish have also come out. Although Hannu Hautala has already earned his arts pension, his versatile illustration of calendars, postcards, and articles still continues. In 2002 Hannu received an honorary doctorate from the University of Oulu as recoqnition of his meritorious career that has lasted over three decades. Hannu Hautala has had a long and meritorious career as the pioneer of Finnish nature photography. The photographer was born in 1941 in Töysä, and has been living in Kuusamo since 1979. Hannu Hautala’s path from a village shopkeeper’s son into an internationally renowned nature photographer has demanded unrelenting work and perseverance. Hannu Hautala’s interest in photography started at a very young age, as he studied the pictures of a dictionary and dreamed of a camera of his own. Since his parents did not fulfil his wish, he compensated the lack of a camera by wandering in the forest watching birds and their migrations, fixing nesting boxes and ringing birds.In the mid-fifties Hannu bought his first camera with money he earned by picking lingonberries. From the very beginning of his hobby, his biggest interest was filming birds, despite of the undeveloped optics of cameras of that time. Close range photography demanded resourcefulness and persistence, making Hannu a skilful builder of hiding sheds at an early age. Those days there was not much literature on photography, which meant that Hannu had to learn everything on his own. In the late fifties a book on nature photography by Allan Paulin and Veikko Korpelainen came out, which had a great impact on Hannu. secondary school, although it was a custom those days that the eldest son was educated. - All of the time I would have had to sit at school and learn nothing, I was able to wander in nature. Hannu Hautala left his home in Tuuri at eighteen, when his parents sent their firstborn to in a gardening school in Pyhäranta. In 1960, after gardening school, Hannu enlisted to the army, where he worked as a tank mechanic. After completing his conscription, the army employed Hannu for another year, which gave him the possibility to acquire proper photography equipment. With the money he earned, he bought by instalment an Excacta Varex camera with a 400 mm objective. - That’s when it really started, others were laughing with astonishment as I was speeding with my bike from Parola airport to Renko, following the first Ural Owls I’d seen in my life. That is when I took my first real pictures.After working for the army, Hannu started working for a dirtmoving company as a caterpillar driver. The salary was fair and combined with the daily allowance his earnings grew quite big, and he was able to pay the expenses of photography. - I was making money hand over foot, and in weekends I took a taxi home to Tuuri to photograph, that way the working week wasn’t so bad. Fate intervened in Hannu’s career, when he fell of the machine and broke his shinbone. Using his insurance payment, he left for Helsinki and started taking mechanics courses. In 1964 Hannu got a job as a motor mechanic, as a new Scania garage was opened in Seinäjoki. In Seinäjoki Hannu realized his long-time dream and bought a Citroen 2 CV. To him it was the best car for terrain, and he ended up exhausting four Citroens one after the other. With his car Hannu could easily travel from Seinäjoki to familiar shooting spots in his native place. He also travelled to other places in Finland and shot materials for his first book “Erämetsän elämää”, which came out in 1968. The book had a huge mental significance for Hannu. A publication and passionate dedication to photography brought Hannu recognition, and in 1970 he was granted a six-month arts grant for the first time. The news of the grant came in April, and in May Day 1970 Hannu closed the garage door and became a full-time photographer. A good friend of Hannu’s introduced him to his future wife Irma, who was working as an office manager in a gardening company in Helsinki. After a short courtship Irma and Hannu had a Christmas wedding in 1971. Hannu moved to Helsinki, from where he travelled all around Finland, taking pictures for his upcoming book “Suomen kololinnut ja muut pökkelöpesijät”. During these trips he also got to know the Kuusamo area and got acquainted with bird hobbyists from Kuusamo. Making the book also required intensive sessions of developing black-and-white pictures in a rented cellar in Vuosaari in Helsinki. There was one extra room with a mattress, where Hannu used to sleep between developing sessions during the most hectic days of the book project. When Hannu was living in Helsinki he also published articles in different magazines quite frequently. Photojournalism was a very important part of Hannu Hautala’s work in the 1970’s, and as consequence of this, Hannu was accepted as a member in the Press Photographer’s Association in Finland. The courses for press photographers, which had visiting lecturers from as far as America, provided Hannu with up-to-date information on what was happening in the field of photography, which was very important for him. In 1978 Hannu Hautala won the prize for informative journalism. Developing black-and-white pictures gave Hannu in a sense a higher education, due to all the hours he spent in the darkroom puzzling how to turn a bad negative into a good print. - Through the magnifying machine, I was looking at a negative that I had first overexposed, then overdeveloped, thought of the cropping and finally exposed it to as gentle a paper as possible to bring out the entire scale of shades. That’s where I developed my own way of compiling a photograph, and it became my strong point in fast shooting situations. Living in a small studio in Helsinki was often agonizing for Hannu. To ease his longing of the forest he sometimes carved a log into kindling to get a pitchy smell to his home. Hannu dreamed of working as a park-keeper, and applied two times for a position, but was not chosen despite his good intentions. -Since I wasn’t able to realize that dream, Irma and I headed north in 1977 to check out possible places for a home. We came to Kuusamo from the north through Savukoski and Salla. I found the two previous places too small for me, so we set our sights to Kuusamo. Hannu started to look for a house in Kuusamo, and with some help from his friend who worked for the national land survey he finally found a suitable house for his family. He bought the house in 1978, and the Hautalas moved to Kuusamo in 1979. After settling down and starting to work he realized he had made an excellent choice by moving to Kuusamo. - Only after moving here I discovered what a wonderful place I had come to, here is where the southern, northern and eastern species meet, and with the calcareous soil, there is a lot of rare flora here you can’t find in other places. Here I found the light and the colour; forest glowing with autumn tints, first snow, the blue of the polar night, the divine April nights and the luminous summer nights. Even during the darkest time of the winter in December, the sun lingers above the horizon just long enough to take a picture. This is what I’ve experienced in Kuusamo, and here is where I will be laid to my final rest. “The Land of the Siberian Jay”, a book published in the beginning of the ‘Kuusamo era’ in 1984, is all about finding the ‘light of Kuusamo’. Hannu finds the Siberian Jay itself a very interesting bird to photograph, not only because of it’s colouring, but also because it’s connection to a lot of deeply rooted beliefs about human existence. “The Land of the Siberian Jay” was chosen as the nature book of the year in Finland. A huge edition of 33 000 copies came out, which brought Hannu both economical and artistic independence. - I realized I could now buy the equipment I wanted and make the best book in the world. Before I was able to blame the equipment for bad quality, but now I could no longer hide behind the equipment. because it made people ask for more of his pictures than he could provide. The success also enabled him to negotiate publishing contracts that were more to his liking. In 1987 Hannu received a 15-year state grant for artistic work, which brought him even more creative freedom. Together with his trusted maker-up he carried out big book projects, “Whooper Swan” in 1988 being one of the most important ones. - Every Finnish home must have the three big books, the Bible, the Kalevala, and the book about the national bird of Finland, whooper swan. That is why we made the book look as splendid as we could. A jubilee edition was also published, and the first copy was given to President Mauno Koivisto. The three books published in the early 1990’s, “Winter of the Finnish Taiga” (1991), “A Summer’s Night” (1992) and “Wild Water” (1994) form a trilogy of a kind, where Hannu has had the freedom to implement his way of portraying the phenomena of nature in different seasons. This was also a time when Hannu got a lot of recognition. He became an honorary member of the Finnish Association of Wildlife Photographers and received a Cultural Award of the Committee of Arts of Oulu County in 1991. He also got several honorary mentions as well as a category prize in the BBC “Wildlife Photographer of the Year” competition, and became a Knight of the Order of the White Rose of Finland in 1992. From the mid-eighties up to the 21st century, Hannu’s books have been published also in Swedish, English, French, Japanese, Russian and Italian. During the 1990’s Hannu wanted more and more to bring out his own vision in his work. His books “Moments of Movement” (1995) and “Colourscape” (1999) represent his artistic experiments from the 90’s. millennium has been for Hannu a slow drift into retirement. - The ostrobothnian has yielded; my lifework is done. My monuments are the books I’ve made, I’ve always been actively involved in their creation all the way from the design to the final colour definition of the printed materials, which has not always pleased the publishing professionals. Hannu Hautala’s lifework as a wildlife photographer has been uninterrupted from the start. Books have come out regularly, but lately most of the ideas have started to come from outside sources. Nevertheless, the ostrobothnian has not caved in entirely, proof of which is the book “Land of My Happiness” (2005) that represents an experimental layout. The book has wide panoramic pictures that utilize the whole spread, which has been accomplished by using modern methods of photo manipulation. The retired nature photographer doesn’t have time to idle about. Nature photography centre in Kuusamo dedicated to his lifework still keeps him a busy man in addition to his photography, which is still a priority in his life. - For a photographer, every minute spent away from nature is a wasted minute.